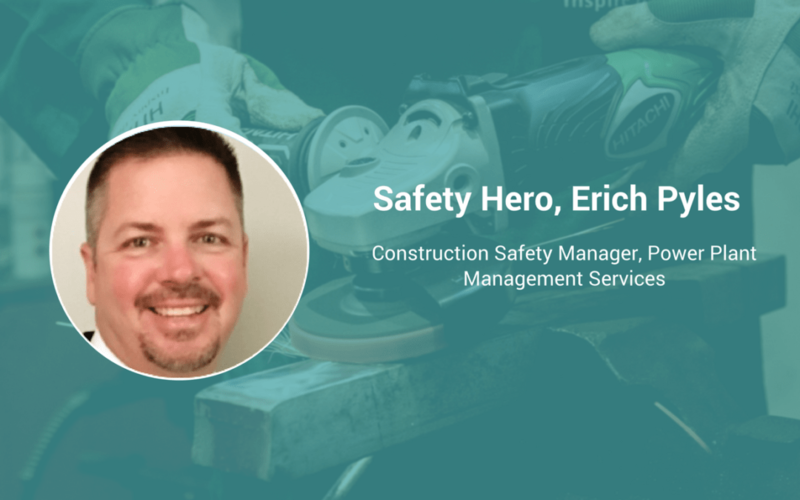 Safety Hero Erich Pyles is as passionate about the safety profession as he is about his family. An Army Veteran of eight years and recipient of two Purple Hearts, Erich learned the importance of safety and care for others early in his service. Erich is a Certified Environmental Safety Compliance Officer (CESCO), Construction Health and Safety Technician (CHST), Registered Environmental Professional (REP), Safety Trained Supervisor-Construction (STSC), and Certified Environmental Storm Water Compliance Professional (CESCP) and is an alumnus of Columbia Southern University where he earned his Master of Science Degree and Bachelor of Science Degree in Occupational Health & Safety Management. Erich also has an Associate of Science Degree in Business Management from Barstow Community College with an Industrial Hygiene Management Certificate (CIHM), Six Sigma Green Belt and Project Management Certifications. Erich has over 20 years of diverse leadership and motivational skill sets holding key positions in Environmental, Health & Safety, Government Contracting (OCONUS), Military Operations – US Army (CONUS and OCONUS), Power and Utility Generation, and QA/QC processes for complex systems. Currently, Erich is a Construction Safety Manager for Power Plant Management Services, LLC. I became involved in safety to some degree while in the Army but developed a strong interest in the field as a union boilermaker. At first, I wasn’t sure if “safety” was really for me – it was outside my comfort zone. Nonetheless, I realized that the field had many opportunities for me to help coach and develop others, and even mitigate or prevent hazards that may keep others from getting hurt. I found deep satisfaction in knowing that my work directly helped my coworkers. Civility, stress/time management, and a willingness to lead by example. Practicing civility will give you the upper hand in any interaction that you have. Employees will respect you and will listen to you when you make a point regarding safety and day to day operations. And as a safety professional you must lead from the front by educating, coaching, and mentoring employees at all levels of a project. Outside of the military, I can honestly say that I’ve never faced a serious incident in the field. However, there have been a vast number of minor incidents that have ultimately raised questions and allowed me to develop a higher awareness for safety management with respect to compliance and the employee(s). First, as safety professionals, we are your resources, and we’re here to support the company and personnel. Second, a proactive approach to a safety culture is key and starts at the top. Third, always acting in a reactive manner will get you nowhere. The idea that an iron fist and strict compliance policy produces the best results is completely false. That approach creates a disengaged safety culture and reduces safety overall. If we, as safety professionals, can help others to understand the importance of safety and compliance, I believe that we will end up with an engaged employee population that cares about safety; thus, we build a safer work culture. My work ethic and eagerness to learn. Everything from the business, to the people, and being able to support the team. I want to help however I can. That approach leads to a much better working relationship with our people, team members, and leaders. Safety professionals are truly needed but can’t be at several locations at the same time. Companies should educate, mentor, and trust their managers to uphold the safety responsibilities within their realm of day to day operations. This is where the safety professional(s) come into play – we can be the advocates, mentors, and motivators behind the company and manager’s success. At the end of the day, we are all responsible for the health and welfare of each other.